A Real Morning Kicker! No more tiring day ahead, start your day with the strong kick of Mouth watering and flavorful Maxwell House Coffee mix. 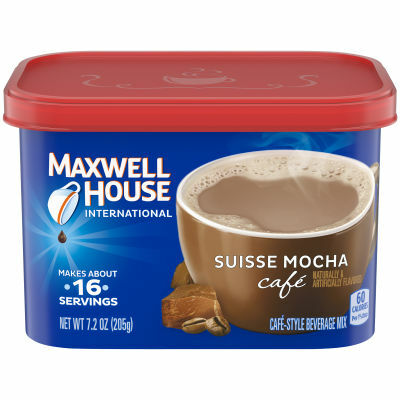 Maxwell House International Coffee, Suisse Mocha Cafe contains non-dairy creamer, mild flavor of cocoa, instant coffee, non fat milk, natural and artificial flavors makes such a classy and luscious coffee that refresh your senses and helps you to stay active and alert whole the day. Savor the Fondness Best coffee not only gives you a good taste but it can stimulate you and relax you. Maxwell House International coffee gives you both at ones. It is easy to make just pour the hot water mix some heaping amount of coffee mix in it and savor the fondness. Cookies or some baked items are the perfect complement of this cafe style coffee. Serving size 1 1/3 tbsp (13g).